provides a hot home cooked breakfast every morning during your stay. There are many nature trails to experience surrounding the Majestic View Bed and Breakfast. 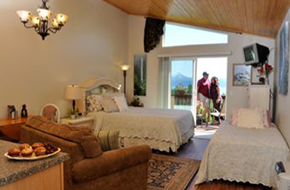 You are able to enjoy the true Alaskan experience surrounded by nature at the Majestic View Bed and Breakfast. At Majestic View Bed and Breakfast, I offer accommodations with views like no other in our area. You will experience the wonderful mountain scenery of the beautiful Kenai Peninsula. 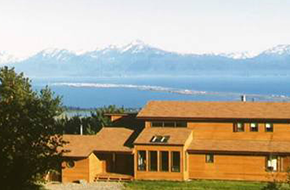 With views of the Homer spit, bay, glaciers and mountains in the surrounding area, your lodging stay with me will be truly unique and glorious. The cabin is located in the wilderness setting close to Homer, AK. Take time out of your day and step out onto the deck to soak in the beautiful landscape that is Alaska. The property is also surrounded by multiple nature trails. You do not have to go too far to catch a glimpse of our local moose; they have been known to wander into the garden from time to time. The B and B offers a hot and mouthwatering breakfast ever morning during your stay. You will enjoy the delicious homemade breakfast that Maria whips up. She will even trade in the breakfast for a bagged lunch if you are headed out early for a little fishing. Located within 3 miles of Homer, AK, you will be able to experience the Alaskan lifestyle to its fullest. Take a trip into town after a walk around the trails for dinner or shopping. The convenient location offers up the best of both worlds; the Alaskan wilderness and the small town living. 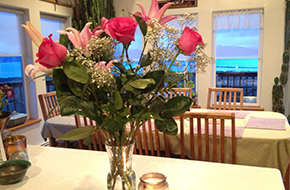 Book a hotel room with me at Majestic View Bed and Breakfast in Homer, AK today for the one-of-a-kind Alaskan experience you won’t find anywhere else.